Dance Team Try Out Day... the day Liv has been eagerly anticipating for weeks has finally arrived! Last season she participated on a team of Competitive girls with our local dance studio and had the time of her life. With the spotlights lighting their way, these amazingly talented girls danced all the way to the Nationals in Vegas last July. Dance has been a part of Liv's life since she was born. At the tender age of 11 months she would hang onto the coffee table, beaming smile on her face, bouncing up and down to the beat of the music. 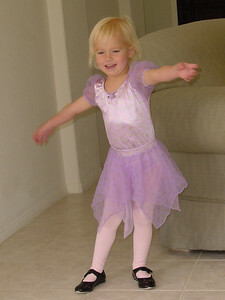 At 2 she enrolled in her first tap class and "entertained" us with hours of boisterous tapping each and every day. Today, her feet are rarely still as she sways to rhythms streaming through her head, and she is frequently seen for hours on end in our spare room dancing the day away. 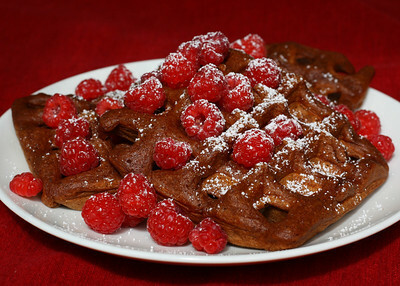 With today being such a special day, I could in no way reject her request for Chocolate Waffles... even though they were not on the healthy pre-dance diet. We figured we'd add a touch of spelt flour and top them with our farm fresh raspberries from our local Farmer's Market to increase the health benefits and maybe supplement with a banana and yogurt a little later. As my back was turned, Liv created her own topping, assuring me that whipped cream did indeed have calcium - which we all know is important for growing dancers bones! 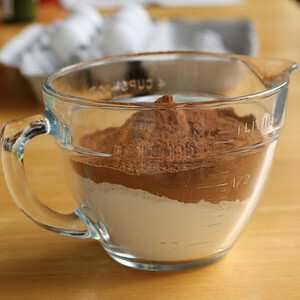 In a medium bowl whisk together the flour, sugar, cocoa powder, baking powder, salt, and baking soda. In another bowl whisk the eggs, melted butter and vanilla, then add the buttermilk. Add the wet ingredients to the dry ingredients, stirring just until combined. Allow to rest for 5 minutes. Note: we mixed half of a mashed banana in our last batch of the waffles. An excellent addition! Aww how cute. She is amazing! And a girl can always indulge a bit. How cute is she! That was a great request to start the day. Goodluck!!! What a talented girl you have! And what a wise choice to start the day with chocolate :o) Good luck on the try-outs! She is so cute! 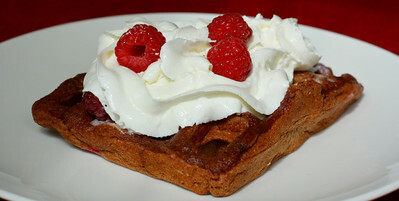 I don't blame her one bit for asking for these scrumptious waffles! I would top mine the same way. What a sweet little girl. You really can't go wrong with chocolate at any time of the day! What a precious, talented little girl you have! I am so glad that you were able to celebrate this special day with such a yummy recipe. I would have asked for these too! I hope the try-outs went well! Thanks everyone! I'm so proud of my girl... she had a good try out, and we get results in a week. She has really appreciated all of your comments and is telling me "See Mom... I told you chocolate was OK any time!!". Liv is adorable! Great breakfast choice, I'm sure she went with a smile on! It's great she started so young! Tell her I know she will do well! That is awesome! Congrats Liv! I remember those days! I too was a dancer for a very long time (since I was 2 and did the tap and all that jazz, pun intended haha). She is awesome! The chocolate waffles looks phenomenal and so does Liv! Best of luck! When my son was Liv's age he was addicted to chocolate/chocolate chip muffins for breakfast (insert my sigh of embarrassment here) and he turned out to be a strong healthy adult. So at least she doesn't eat them every day! I'm supposed to comment on something as insignificant as a waffle after seeing your gorgeous and immensely talented daughter do THAT?? Oh my gosh, she was amazing. How can she kick that high? I'd be in traction. I might even need surgery. Yeah, yeah, waffles look great. Now back to your girl. Wow, wow, wow. Tell her she's awesome, wonderful, very, very talented! Judy, she loves sugar! We try to keep the sugar at a low level, but oh it's a battle! She's pretty darn healthy though, so I really can't complain! Mom Chef, wow!! You made our day! Liv saw your post and the smile spread across her entire face and her eyes lit up. Thank you! !